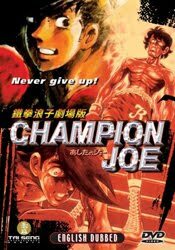 The Anime Archivist: Video Backlog: "Champion Joe (Tomorrow's Joe)"
Story Outline: A young man named Joe Yabuki runs away from the orphanage he has lived in all his life. He soon runs into a homeless man named Danpei who was a former boxer and trainer. Joe resists Danpei’s attempt to get him to become a boxer, but he can clearly see his talent and persists. However Joe is sent to gaol where he gets into a fight with other inmates including the leader Nishi. Because the ruckus, Joe and Nishi end up being transferred to a juvenile prison where they are harassed by other inmates. The leader of the inmates, Rikiishi, clashes with Joe and the two of them constantly fight. Danpei doesn’t give up and communicates boxing lessons to Joe via mail. Latter Danpei is allowed to train Joe and others in the prison and a match is set up with Joe and Rikiishi which inspires other inmates to take up boxing. Upon his release, Rikiishi vows to return to professional boxing which he abandoned when he went to gaol. Latter Joe and Nishi are released and after getting the disgraced Danpei back into the boxing federation, Joe soon works his way up to the top of his weight division in boxing. However he soon has to confront Rikiishi again, and Rikiishi will do anything in his power to win. Mini Review: Holy mother of god. Compare what was screening on TV in the west in terms of cartoons in 1970 then compare with this. Yes, another sports anime I’ve watched, however this is the big daddy of sports anime (screened a couple of years before “Aim for the Ace!”). It’s really gritty, violent, cruel and something which I thought was unusual, it’s focus is squarely on the working poor. Certainly a lot, if not the greater majority of anime and children’s fare in Japan focused on middle class to upper class situations. This anime shows the grime and squalor of the literally dirt poor lower rungs of Japanese society in vivid detail. Also the desperation and the nothing to lose attitude of the characters is quite noticeable too. The director was of course Osamu Dezaki (though Mizubo Nishikubo constructed this theatrical compilation of the TV series) and his style and trademarks are quite apparent, despite the fact this is the first TV series he directed. Certainly this movie edit is a little bit slow to start, however it soon picks up and the focus of the show (boxing) comes into clear view. I think I’d prefer seeing the TV series over this 1980 cut of the show and it is quite long at over two and a half hours. However that last hour and a half are really well written and very dramatic. Plus it’s really unlikely we’ll see the TV show in English ever. 7.5 out of 10.